The Island Highland Gathering at Robin Hill on the Isle of Wight took place again this Sunday - 2012 being the second year for the event. Robin Hill Adventure Park & Gardens is already one of the main Isle of Wight attractions for families and is the home of the ‘Bestival ’ music festival. However, the gathering (organised to raise funds for the Earl Mountbatten Hospice) bought a traditional, Scottish style day of entertainment, something quite unique to the Isle of Wight! 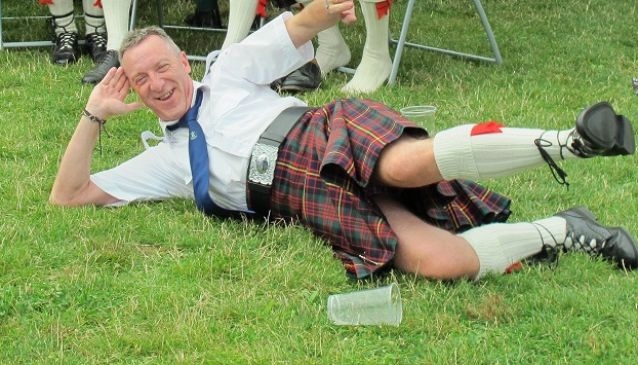 This year, the Island Highland Gathering fell on one of the hottest days of the year. It was a very civilised atmosphere, with people sitting under the shade of their parasols, on collapsible chairs and picnic rugs, sipping on a drink or two. Events included solo pipers, pipe bands and highland games such as tossing the caber. There were plenty of stalls to look around, including food and whisky tasting. Various people had a go at the games, including some staff from Robin Hill and Isle of Wight Radio. The commentator had a great sense of humour, making everyone’s attempts at tossing the huge, heavy cabers very funny! Although the main event was happening down in the open park, there were other activities going on around the rest of the grounds too, including bagpipe competitions and falconry displays. Robin Hill itself is a beautiful place; the cool woodland with its pretty planting and pathways amongst the tall trees was very appealing on a hot day! Of course as usual, there was plenty on offer throughout the adventure park for the kids, being one of the most popular family attractions on the Isle of Wight. We had a great time! See our Island Highland Gathering photos on our Facebook page. Keep an eye on our Isle of Wight events page to find out if there will be an Island Highland Gathering 2013!